DIWA, the Digital Imaging Websites Association, today announces three digital camera product awards, the first such awards from this recently launched industry organisation. Since November last year, testers from DIWA member websites covering the four corners of Europe have evaluated and compiled test scores for dozens of cameras. DIWA's rigorous technically-based scoring system has produced two winning cameras to date: the Olympus E-1 and the Casio QV-R40. The latter merits a DIWA Silver medal in the category of Amateur Compact camera and the Olympus E-1 a Gold medal in the category of Professional System camera. In addition, DIWA has chosen to make a special award to Olympus in recognition of the innovation invested in the Four Thirds standard-based Olympus E-System, of which the gold medal-winning Olympus E-1 is the first example. DIWA's general manager, Ian Burley, commented: "The seed of the idea that turned into DIWA was sown by DIWA's test manager, Kai Thon, several years ago. However, it has been the hard work of a dozen or so people in the last year that has brought DIWA into reality and to the point of making our very first awards." Born in Europe, but with plans to embrace future members from all over the globe, DIWA concentrates the talent and experience of independent journalists working for Web-based digital imaging publications. DIWA's goal is to be the standard setter for identifying digital imaging product excellence and rewarding manufacturers that meet DIWA's tough criteria for winning these awards. Ian Burley added: "Today we have awarded our first three medals, but this is just the beginning. I expect our unique, up-to-date and trusted process for deciding awards will identify the best the industry has to offer over the coming months, culminating in our platinum medal annual awards for the Best of the Best." A growing independent, authoritative, industry organisation: The Digital Imaging Websites Association (DIWA) is a growing group of independent Web-based specialist publications dedicated to digital imaging. DIWA harnesses the collective talent and expertise of its members, resulting in industry awards that command unparalleled confidence and value, both for consumers and the industry, alike. DIWA awards come in the form of bronze, silver and gold medals. Unique bullet-proof test scoring procedure: DIWA product test awards are exclusively decided through the analysis of multiple test scores from different DIWA testers, testing different samples of the same product. A very detailed and comprehensive standardized scoring procedure is employed, tailored carefully for each category of product. Multiple testing eliminates the chance of an, isolated, unrepresentative product sample or test error, or even hidden bias, from affecting the trustworthiness of the overall result. Awards throughout the year: DIWA is also unique in its policy in issuing awards for deserving products throughout the year, culminating in annual best of the year Platinum medal awards. The DIWA multi-lingual Web site: At the heart of the DIWA organisation is its multi-lingual Web site, www.diwa-awards.com, where you can find links to the latest reviews published by DIWA member publications. 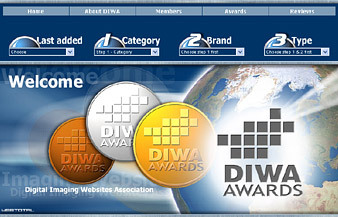 The site also archives DIWA awards and is designed to aid consumers in their choice of imaging products.